Of course. dates are subject to change. I don't really see any spoilers in the titles. But maybe that's because each of the episodes I've seen lately have just blown my mind and I wasn't expecting certain things. So even when I think I have it figured out, they throw something new in there that completely boggles my mind! LOL! This show is so awesome! EDIT: Thanks for posting this! I wasn't sure if they had revealed anything about the remaining episodes or not. Good to know the titles at least. Beck agrees to go on a date with Paige, but their night is cut short when Paige is betrayed by Pavel and thrown into the Games; Beck thinks he may finally be able to win her Paige over by rescuing her as The Renegade. When 'The Stranger' returns to Argon City to plot revenge on Beck and Tron, Beck is forced to choose between saving Tron or his friends. 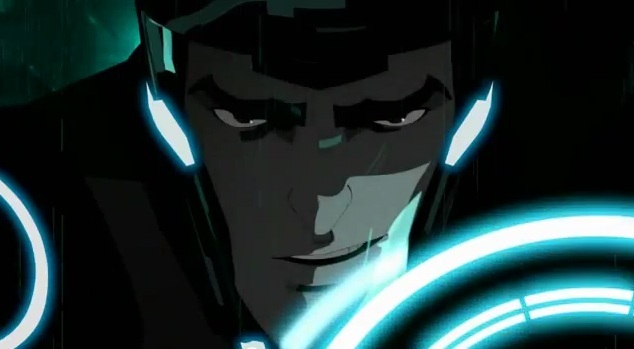 Terminal might be about the "death" of Tron and his "resurrection" as Rinzler. Or maybe Beck and Cyrus merge into the same program once again (a theory I have after watching "the Stranger") and Tron is forced to terminate him. Or the merging process just destroys them both akin to Flynn and CLU at the ending of Legacy. I don't see this show having a happy ending at all (which would be sort of pointless since we already know what happens afterwards). I'm thinking it might have something to do with a computer terminal.Maybe we'll see some real user power in this episode..
Paige & Beck on a date? Curious how Pavel betrays her. Maybe he's the jealous type. Paige did turn him down multiple times already. Btw, checked again at the URL where I found the titles. They also list the countries where the series has or will air. Some won't air it until 2013. So...who knows. Maybe there's hope. Perhaps. I remember that before the series premiere someone on the creative team said something along the lines of " We already have the plot of season 1 and 2 ready and we are currently working on the plot of season 3"
However this just means that if Disney doesn't greenlight season 2 then a lot of plot threads wont be resolved, we will never know what happened to the upgrade disc from "Price of power" , What was CLU planning to do with his giant recognizer or how Tron became Rinzler. I don't think Tron will become Rinzler in "The Terminal" because there has been no build up to it. I'm betting that Page and Beck(as opposed to 'The Renegade') will have an extended (and possibly personal) encounter in 'Welcome Home', because I don't think they've met more than three times before that, and it wouldn't make much sense for Page to go on a date with some program she barely knows. Disney on Direct TV for the Los Angeles area NEVER aired Grounded, We Both No How this Ends" as I have Uprising set on my "to record" list" on the DVR. Found this summery on the final episode of the season. "I'm dying of am incurable illness and I need you to STOP IT WITH THIS GIANT WAR MACHINE." Something tells me there's a little more to things than the synopsis suggests. From the way it's worded, I think Beck is the one who is dying(likely from his strange injury he received in "The Stranger"), not TRON. Aha! Still, you have to admit that's a pretty strange way for somebody to handle that kind of problem, at least the way that synopsis makes it sound. One track on the soundtrack is titled "Goodbye Beck." Could be either. Able is no longer available to provide the substance needed for Tron's healing chamber. As for Dyson's commissioned war machine (via Clu's orders)...maybe it has a big ole research lab somewhere inside? Dyson was the one who gave Tron his illness in the first place. As a side thought, perhaps the reorganizer's purpose is to gather programs for mass repurposing at some point as a testing ground for what occurs in Legacy.. With Cyrus' "help" in Beck being blamed for the death of innocent civilians the occupation would have a convenient cover. Alan1 Wrote:One track on the soundtrack is titled "Goodbye Beck." The title of track #14 is "Goodbye, Renegade" which could be taken several ways. Hopefully not character death. I haven't seen "No Bounds" so correct me if im mistaken, but now Tessler ( one of the only soldiers of the ocupation that doesn't get defeated by Beck with one punch) has the upgrade disc, when he was upgraded a bit and confronted the renegade he almost killed him , so if Tessler doesn't appear in "The Terminal" that means that the upgrade disc story arc ends with tessler having the ultimate weapon...and doing nothing with it.